After six months of streaks, showdowns and social media mayhem, it's time for even more drama. With intriguing storylines from top to bottom, the 2018 playoffs are shaping up to be must-see TV. Here's why each of the postseason's 16 teams will leave you on the edge of your seat during one of the most binge-worthy NBA playoffs ever. Remember all the doubts about whether James Harden and Chris Paul could work together? Those questions seem hilarious now. The Rockets rewrote the franchise record books en route to the best record in the league as Harden staked claim to what should be his first MVP award. Who has the most to prove? Harden and Paul. There isn't a duo in the NBA that has more to prove in the playoffs. That's why they joined forces last summer. A failure to advance past the second round is the one blemish on Paul's surefire Hall of Fame résumé, never mind that his playoff numbers (21.4 points, 9.4 assists, 48.4 percent shooting) compare favorably with his career stats. For Harden, his most recent postseason memory is a horrible no-show (10 points, 2-of-11 shooting, 6 turnovers) last year in Game 6 of the West semis against the Kawhi-less Spurs that ended the Rockets' season. Harden's historic 60-point triple-double aside, the story of these Rockets has been the collaborative brilliance of their co-superstars. That was epitomized in their Dec. 9 win in Portland, the first time the pair played together in a clutch situation, which didn't happen for a while due to Paul's knee injury and the Rockets' dominance upon his return. Harden and Paul took turns carving up the Blazers' defense, accounting for all but one bucket as the Rockets scored 21 points in the final five minutes. James Harden broke Wesley Johnson's ankles with a stepback 3-pointer earlier this season, and there's always a chance we'll see more defenders go down. 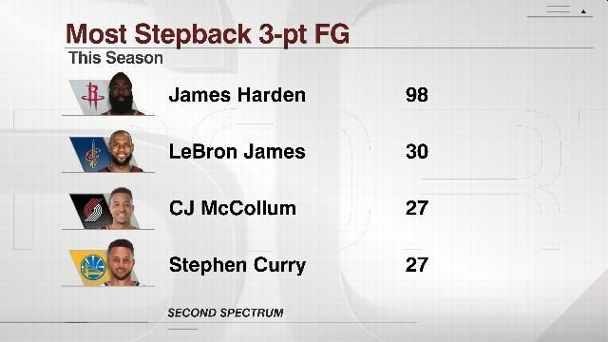 Harden has made more than three times as many 3-pointers on stepback shots as any other player this season. Let's put this in Texan terms: It ain't a success without a championship parade. The Rockets never got too high during any of their three double-digit winning streaks -- or after breaking the franchise record for wins in a season -- because they've had a championship-or-bust mentality from the moment Paul arrived in Houston. The Rockets confirmed their belief that general manager Daryl Morey had put together a team great enough to challenge the mighty Warriors by cruising through the regular season. They are 16 wins away from satisfaction. Clint Capela vs. Karl-Anthony Towns. Towns, arguably the NBA's most talented center, would have to have a monster series for the Timberwolves to pull off the monumental upset. He averaged 23.8 points and 14.8 rebounds in four regular-season meetings, but the Rockets still swept. Capela can't come close to matching Towns' offensive repertoire, but the Rockets big man has earned the right to come up in conversations about the league's best young centers. His ability to finish around the rim can expose Towns' defensive deficiencies: Capela put up 18.8 points per game against the Timberwolves this season, his highest average against any West team. The defending champs have petered into the playoffs, having lost 10 of their past 17 games. The team has struggled without its leader, Stephen Curry, who will be sidelined for the opening round with an MCL injury. Can the team play at a high level without Steph? Can the Warriors turn it on during the playoffs? Is Steve Kerr's voice still effective? Those are some of the questions facing the Warriors as they enter the postseason looking vulnerable. Kevin Durant. Golden State was 40-10 with Curry in the lineup and an underwhelming 17-14 when he was in street clothes. Durant, along with the rest of the team, has not been able to adjust to Curry's departure in part because the Warriors are mostly running the same system in which the two-time MVP flourished. Will Kerr alter the offense and cater it toward Durant? Utah's pounding of Golden State by 40 points was an extreme display of how this squad has been going through the motions and living off supreme talent. The Warriors could simply flip the switch in Game 1 of the playoffs, but they're not going in with the best of habits. 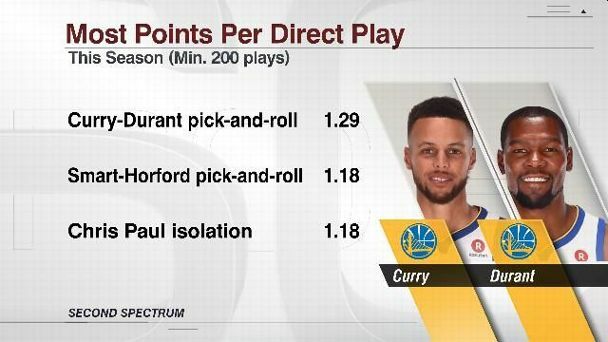 The best play in the NBA this season has been the Stephen Curry-Kevin Durant pick-and-roll. With Curry as the ball handler and Durant as the screener, the Warriors have averaged 1.29 points per direct play. No other play type -- pick-and-roll or otherwise -- has averaged more points per direct play. It's title-or-bust for the defending champs. Golden State used to have a small-ball advantage, but now the majority of NBA teams are made up of small, shooting lineups. Injuries and the emergence of the Rockets could derail the Warriors' quest. They might be favorites, but this won't be a cake walk. Draymond Green vs. LaMarcus Aldridge. For the Spurs to have any shot at pulling off an upset, it will be imperative that Aldridge thoroughly dominates. And in order to do so, he will have to go through one of the best defenders in the league in Green. With Leonard out, San Antonio's offense goes heavily through Aldridge, and the Warriors will likely leave Green on an island to test Aldridge's efficiency. If he's not commanding a double-team, the Warriors will exit the first round virtually unscathed. This matchup will determine how serious this series becomes. On track for another season in the vicinity of .500 through mid-February, Portland caught fire during a 13-game winning streak that propelled the Blazers into the top half of the Western Conference standings. Terry Stotts' defensive scheme, built around preventing high-value shots and forcing 2-pointers outside the paint, has turned Portland's liability into a top-10 unit. The playoffs will be the Blazers' opportunity to prove that the combination of improved defense and scoring provided by the guard tandem of Damian Lillard and CJ McCollum makes them a threat to the West's elite. Jusuf Nurkic. The addition of Nurkic midseason was a key factor in last year's (now trademark) Portland second-half run, but the Bosnian Beast was limited to 17 total minutes in the Blazers' first-round sweep at the hands of the Warriors. Although Nurkic's offense hasn't carried over on a consistent basis this season, his ability to protect the rim has anchored Portland's defense. With restricted free agency looming, Nurkic can solidify his value by avoiding foul trouble and making good decisions with the ball on offense. Coming off a home loss to the Jazz that dropped them within a game of falling out of the playoffs, the Blazers started their 13-game winning streak in style. They blitzed the Warriors from the start, running up 40 points in the first quarter and withstanding a 50-point effort from Kevin Durant to win 123-117. The game showcased Portland's winning formula offensively: a huge game from Lillard (44 points, eight assists) with plenty of scoring from McCollum (29 points) and a strong effort by Nurkic (17 points, 13 rebounds). McCollum ran 2.70 miles per game this season, the most by any player in the NBA, while Lillard ranks tied for eighth on that list at 2.54. Portland is the only team in the NBA that has two players in the top 10. 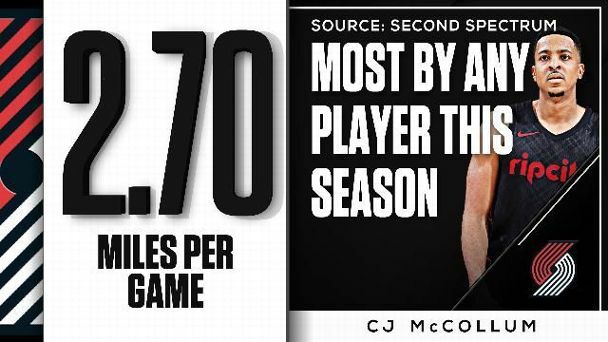 That's even more notable considering the Blazers rank 19th in the NBA in pace (possessions per 48 minutes). The Blazers are competitive in the second round of the playoffs. Winning a series wouldn't be new for the Blazers in the Lillard-McCollum era, though they benefited from injuries to Blake Griffin and Chris Paul during their first-round win over the Clippers two years ago. To justify the luxury-tax bill that re-signing Nurkic and backup center Ed Davis would likely require, Portland could use a couple wins in a matchup with one of the West's powers. Anthony Davis vs. Jusuf Nurkic. Although Jrue Holiday vs. Damian Lillard might be more compelling in terms of overall talent, the center matchup in this series will probably be more important to the outcome. Portland's defensive scheme is centered around keeping Nurkic in the paint to defend the rim; according to Second Spectrum data, Nurkic defended 8.9 shots per 100 possessions inside the restricted area, third most among starting centers. Davis' ability to pull Nurkic away from the basket, either in isolations or in pick-and-pop plays, will provide other Pelicans an opportunity to penetrate. The Thunder spent the season confusing the league and themselves. The glimpses of potential in emphatic wins mixed with head-scratching losses kept them at risk of not making the playoffs until the final week of the season. But with top-tier talent, they could have the Western Conference on notice. The thinking all season was the Thunder were built for the postseason. Russell Westbrook. As with everything Thunder-related, this postseason will be yet another evaluation and pending referendum on last year's MVP. All eyes will be on how he manages crucial possessions with Paul George and Carmelo Anthony, if he can stay balanced and if the Thunder can execute in big moments. Westbrook is the Thunder's leader and has established that the team still goes as he does. The Thunder spent the season leaning on their ability to raise their level of play against the league's best (7-4 against the Rockets, Warriors, Raptors and Cavaliers) but played down to teams around or below .500. But when their backs were against the wall and things were on the verge of unraveling, even against the elite teams, the Thunder found a way to stay above water. Winning in Houston wasn't pretty -- the Thunder's three stars struggled -- but some timely playmaking and good enough defense got it done. One reason OKC is so tough? They out-hustle opponents. The Thunder rank first in the NBA in both deflections and loose balls recovered. Leading the way are their two best players: George's 3.9 deflections per game led the NBA, as did Westbrook's 2.2 loose balls recovered per game. In a tasty showdown of star power versus symmetry, there are a lot of fun things to pay attention to: Donovan Mitchell in his first playoff series, going against Russell Westbrook, Paul George and Carmelo Anthony, three experienced postseason veterans who pulled Mitchell aside and offered some words of encouragement following their final meeting in December. But what's transformed the Jazz has been the return of Rudy Gobert and his immense impact on both ends of the floor. Similarly, what unlocks the Thunder and turns them from good to diverse and explosive, is Steven Adams' versatility. Both coaches will try small lineups to pull Adams and Gobert from the paint, but both players are agile and dynamic. Plus, it's just good, solid fun watching two giant human beings go against each other. With Rudy Gobert protecting the rim, the Jazz are the NBA's best defensive team, which makes them dangerous. Add in rookie sensation Donovan Mitchell, who has the ability to score in bunches, and the Jazz are also entertaining. Utah has been playing at an elite level over a span of nearly three months since Gobert got healthy. Only the Rockets had more wins since Jan. 24 than the Jazz, who climbed from nine games under .500 to the No. 4 seed with a 25-5 run in which Utah had the NBA's best point differential (plus-10.7 per game). Ricky Rubio, who will finally taste the NBA playoffs. He has played in high-stakes games internationally for Spain, so Rubio shouldn't wilt under the pressure. But is he a long-term fit with Utah's core or simply a placeholder at point guard next to Mitchell? With a year remaining on his contract, Rubio has played a significant role in the Jazz's run by making foes pay for giving him good looks. Rubio's 3-point stroke has been a glaring weakness throughout his career, but he has shot 43.6 percent from long range since Jan. 24. It was apparent that the Jazz got great value by trading up to draft Mitchell with the 13th overall pick before he poured in a franchise-rookie-record 41 points in a comeback win over the Pelicans on Dec. 1. But that performance validated hope that Mitchell could be the bonafide go-to guy the Jazz so desperately need in the wake of Gordon Hayward's departure. Mitchell, the first rookie since Carmelo Anthony to lead a playoff team in scoring, scored 12 points in the final five minutes that night and showed a killer instinct that is rare in a young player. Think Utah is lost on offense without the departed Hayward? Think again. The Jazz find ways to get good looks. They created 19.8 uncontested shots per game this season, best in the NBA. This season is already a success, not that they'd be satisfied with a first-round exit. Few expected the Jazz to return to the postseason right after Hayward's exit, which could have been crippling for a small-market team that relies heavily on developing homegrown talent. Even fewer anticipated the Jazz could overcome Gobert's missing 26 games due to injury. Quin Snyder, who has quietly established himself among the league's best coaches, deserves a lot of credit. With Gobert and Mitchell as foundation pieces, the forecast is bright for Utah. Joe Ingles vs. Paul George. Russell Westbrook can't win a playoff series alone, as we saw last spring when the Rockets made quick work of the Thunder in Round 1. That's why Oklahoma City pulled off the offseason trade to get George, giving Westbrook an All-Star partner. The Jazz need Ingles, one of the league's better irritants, to keep George from getting comfortable during the series. That didn't happen enough as the Thunder won three of four regular-season games against the Jazz, with George averaging an efficient 21.8 points per game against Utah. 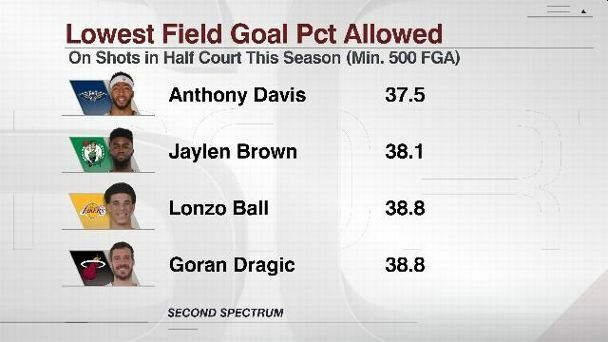 Anthony Davis is worth watching every game just to see what spectacular line he will put up next. New Orleans has surprised many with an inspiring playoff run after losing DeMarcus Cousins to a season-ending Achilles injury. After Cousins went down on Jan. 26, the Pelicans lost five of six games but recovered by going 20-8 since Feb. 10, riding Davis' MVP-caliber play. Playoff Brow. The NBA world will be watching to see what he'll do in his second trip to the postseason. Davis hopes to make this one last a little bit longer than his first playoff experience in 2015, in which he averaged 31.5 points, 11.0 rebounds, 3.0 blocks and 1.3 steals but was swept by Golden State. Can Davis overcome a Portland defense that will spend an entire series geared toward containing him? Davis did more than just carry the Pelicans after the Cousins injury. He went on a historic tear, leading the Pelicans on a crucial 10-game winning streak. His defining moment in that stretch came against Phoenix, when he detonated for 53 points, 18 rebounds and 5 blocks, joining Bob McAdoo as the only NBA players with 50 points, 15 rebounds and 5 blocks in a game since blocks were first tracked in 1973-74, according to the Elias Sports Bureau. If you're into helter skelter, the Pelicans are the team for you. More than simply Davis' dominance since Cousins went down, New Orleans has ramped up the speed at which it plays, ranking first in pace and averaging more miles per hour on offense than any other playoff team. The Pelicans find a way to beat Portland. Let's be real: When Cousins tore his Achilles, the injury figured to rip New Orleans' playoff chances to shreds. But Alvin Gentry's team persevered. Even when the team hit a four-game slide in late March that threatened their playoff chances, New Orleans bounced back by winning the next four games. Every team in the West not playing Houston or Golden State in the first round will feel like it can advance after basically playing playoff-like games down the stretch just to get in. New Orleans has a chance to advance with Davis on its side. Nurkic's ability to defend Davis will be huge, but Holiday will have to find a way to give Davis some much-needed offensive support and counter Damian Lillard. The Pelicans and Blazers are 2-2 against each other this season, but Lillard went for 41 points, 9 rebounds and 6 assists in a 107-103 Portland win the last time the two teams met on March 27. Holiday was more than up to the task as he finished with a triple-double with 21 points, 11 assists and 11 rebounds in that loss. Despite missing its best player in star forward Kawhi Leonard for all but nine games, San Antonio found lineups and rotations that consistently competed with the best teams in the West. Meanwhile, LaMarcus Aldridge became the player the Spurs expected in the summer of 2015 when they signed him as that year's most significant free-agent acquisition. He has been deserving of being included in the MVP conversation this season. Aldridge. The absence of Leonard coupled with a putrid performance in the postseason last year makes him a marked man. In Game 1 of the 2017 conference semifinals, Aldridge scored a career-low four points and finished with a plus-minus of minus-36, which registered as the worst by a Spur in the postseason under Gregg Popovich. In the 43 minutes after Leonard limped off the floor last year with an ankle injury in the conference finals against Golden State, Aldridge posted more turnovers (eight) than made baskets (seven). Second-year point guard Dejounte Murray falls into this category, too, after wrestling the starting job away from future Hall of Famer Tony Parker. Leading Golden State by eight points with 4:44 left to play, the Spurs watched Kevin Durant go off for 15 of his game-high 37 points in the fourth quarter as the Warriors rallied to a 110-107 victory. The fact that Stephen Curry left the game in the first half with an ankle injury only amplified frustrations for San Antonio, which has become accustomed to blowing prime opportunities this season due to shoddy clutch-time performances. The Spurs have missed Leonard's ability to close games. The Spurs still have a superstar stopper, and it is not Kawhi Leonard. Among 212 players to face at least 30 drives against 2018 All-Stars, Kyle Anderson allows the third fewest points per chance on drives, at 0.72. Given all the drama stirred up from the bizarre Kawhi saga and all the tinkering with rotations to get San Antonio into the postseason for the 21st consecutive year, this season is already a success, with Popovich deserving of Coach of the Year consideration. But the real indicator of whether this season has been a success is when, if at all, Leonard returns to the lineup. The Spurs want Leonard back on the floor, but it's not about what he can do to help them win, according to a league source. It's about showing the rest of the team he is committed to San Antonio for the long haul. The team needs to see Leonard in the locker room, in film sessions, on the team plane and at team dinners. Leonard is up for a supermax extension this summer, and a return in the playoffs could go a long way toward alleviating doubts about his long-term prospects in San Antonio. Aldridge struggled with Leonard out of commission during last season's matchup with the Warriors in the conference finals due to Golden State constantly throwing double-teams at him. San Antonio expects the Warriors to continue to throw everything at Aldridge, but the team is confident the power forward is better equipped now to handle such a scenario. The club also believes the supporting cast -- players such as Danny Green, Kyle Anderson, Pau Gasol and Patty Mills -- needs to step up and make the open shots created by Golden State's focus on Aldridge. The suspense held until the regular season's finale, but the Timberwolves are back in the playoffs for the first time since 2004. Jimmy Butler loves the stage the playoffs provide and desperately wants to show he can lead his team into the second round and beyond, but his health will be worth monitoring after he missed more than a month because of a meniscus injury in his knee. Karl-Anthony Towns and Andrew Wiggins, who are supposed to be the future of the Timberwolves organization. But neither young player has developed the way Tom Thibodeau would have liked. Towns has superior offensive talent and showed flashes of putting it all together, but there are far too many times when he doesn't have a solid presence defensively. As for Wiggins, he hasn't shown consistency on either end. The drought is over! Game No. 82 sent Minnesota to the postseason for the first time in 14 years in a de facto playoff game of its own, as Butler poured in 31 points and Towns added 26 in an overtime thriller against the Nuggets. As much as Minnesota missed Butler's All-Star production, it could have also used his grit and determination. Case in point: Butler's average miles per hour getting back on defense in transition ranks first on the team and first among every 2018 All-Star. Among 2017-18 All-Stars, no one gets back in transition faster than Minnesota's Jimmy Butler. It's hard to believe a team that hasn't made the playoffs in 14 years could make the postseason and still have its season considered unsuccessful, but that is the tightrope the Timberwolves are walking. After so much optimism early in the season, Towns, Wiggins & Co. were not able to pick up the slack when Butler went down. The only way the Wolves' season can be considered a success is if they claw their way into the second round. Jimmy Butler came into Wednesday's must-win season finale against the Denver Nuggets on a minutes "guideline," according to Timberwolves coach Tom Thibodeau. After playing just over 20 minutes in his first two games back from knee surgery, Butler racked up 42 minutes in Wednesday's overtime win and comes into this series having to do everything for a Timberwolves team that has gotten crushed by the Rockets every time they've played this year. How far will Thibodeau be able to stretch Butler out now, and how much will Butler be asked to switch onto Rockets MVP candidate James Harden? Those questions will go a long way in determining if the Timberwolves have any chance to steal a game or two in this series. After several seasons of residing in the league's upper-middle class, the Raptors asserted themselves in 2017-18 as the team to beat in the Eastern Conference. They climbed the ladder by injecting spacing and creativity into their offense and by instilling greater discipline in their defense. Kyle Lowry and DeMar DeRozan are the NBA's old married couple -- stylistically and temperamentally different, yet bringing out the best in each other as they mature into their golden years as a backcourt. Then there's the dominant reserve units, which make the Raps' early second and fourth quarters the best show in town. Both DeRozan and Lowry will have to replicate their regular season outputs if the Raptors are to beat the rap as one of the most disappointing playoff teams in recent memory. Among active NBA players, only Rajon Rondo and Jamal Crawford have attempted more field goals in the postseason and converted them at a lower true shooting percentage than DeRozan. Lowry has performed marginally better, but his contributions in the playoffs, in which he has often appeared tired, have fallen well short of the standard he has established as one of the league's best shot-making guards. In Detroit, the Raptors and Pistons were tied in overtime at 119 with less than 10 seconds left, and DeRozan -- who did this near the end of regulation -- was racing down the floor with possession. But rather than play hero ball and settle for a low-percentage attempt when he was met in the lane by a swarm of Pistons defenders on his drive to the rim, DeRozan kicked the ball out to a wide-open Fred VanVleet, who drained the shot from 21 feet, giving the Raptors a win. Trust is an essential ingredient for a championship team, and it is decisions such as that by a team's superstar that help build it. Unlike years past, the Raptors are a lot more than just Lowry and DeRozan. When the duo is off the court this season, the Raptors are still tied for the eighth-most points per chance on offense. Last season, when the star duo was off the court, the Raptors averaged the fewest points per chance league-wide. The Raptors have tasted the conference finals, so anything short of an NBA Finals appearance would qualify as a disappointment, especially as the Eastern Conference's No. 1 seed. Should they acquit themselves well with a competitive series against either of the West's elite teams, the Raptors would have assembled the most successful season of their 23-year-old existence as the NBA's only active Canadian franchise -- and one that has saddled one of the league's most devoted fan bases with plenty of heartbreak. Kyle Lowry vs. John Wall. The two talented point guards are a contrast in styles. Wall races baseline to baseline as quickly as any guard in the league, while Lowry is a fireplug who relies on his strength, fortitude and sweet stroke to exact damage against opponents. All eyes will be on Wall, who has just recently returned from arthroscopic surgery on his left knee. Will there be limitations to be exploited by Lowry, or will Wall, who heard whispers that his team performed better without him, unleash that lightning-quick speed in a series that gets decided at the top of the floor? The Celtics enter the playoffs missing two All-Stars (Gordon Hayward, Kyrie Irving) and one of their top rotation players (Marcus Smart), but they proved all season that they can be competitive no matter how short-handed they are. Watching how Brad Stevens manages his personnel and game plans for his opponent will be worth admission. The Celtics' youngest players have embraced their opportunities all season, and somebody -- maybe Terry Rozier? -- is going to make himself a household name during the postseason. Welcome to the NBA playoffs, Jayson Tatum. Boston's 20-year-old rookie, the No. 3 pick in last year's draft, had a stellar first season. But the question is whether Tatum can continue to be an impact performer on the playoff stage. Without Irving, the Celtics need Tatum to provide a consistent scoring punch. After being eased into the playoffs last season, second-year swingman Jaylen Brown will likewise be expected to elevate his play. Boston's young tandem could dictate just how long this team sticks around. Playing the final game of a four-game road trip without three All-Stars (Irving, Hayward, Al Horford), Boston had no business beating a surging Jazz team jockeying for position in a crowded west. But despite utilizing four rookies as part of a nine-man rotation, the Celtics overcame a double-digit deficit, and Brown hit a game-winning 3-pointer with 0.1 seconds to play to cap an improbable 4-0 road trip. Rookie Semi Ojeleye, who assisted on Brown's winner, and Shane Larkin, who was in Europe last season, topped the Celtics in minutes on this night, hammering home the diverse contributions this team has gotten while overcoming injuries. Want to watch some smothering defense? Check out Jaylen Brown. Whenever he's the closest defender in the half court, opposing players have shot just 38.1 percent. That's the second-best mark among more than 150 players who have defended at least 500 shots this season. After a trip to the East finals a season ago, the Celtics won't be content to simply get through Round 1, but maybe they should be. Any playoff experience the youngest Celtics gain will help Boston down the road. The East is so wide open that Celtics fans will dream of an improbable playoff run by these Zombie Celtics, a group of scrappy, young players who simply refuse to relent despite all the injuries the team has endured. Everybody vs. Antetokounmpo. Limiting Giannis is a tall task that will fall heavily on All-Star big man Al Horford, but Boston will need all of its bigs to step up. Said starting center Aron Baynes: "It's going to be a team effort. It's not one man's job. It's four or five men on a string. We got to all be playing defense and build from that. [Antetokounmpo is] very talented and he's a great player so we're going to have to lock in and do a job collectively on him." In four meetings during the regular season, Antetokounmpo averaged 33.5 points, 10.8 rebounds and 5 assists against Boston (though he was minus-25 during his floor time in that span). Does Philadelphia's young core of Embiid, Simmons, Fultz and Dario Saric have a ton to prove in the postseason? Probably not. That group -- minus Fultz for most of the season -- helped lead Philadelphia to its first playoff appearance in six seasons after a four-year stretch in which the franchise lost an average of 63 games. You can make an argument that coach Brett Brown has more to prove in the postseason than any of his players. Brown admirably endured all of the losing to get to this point. Now that he's here, his strategy, substitution patterns, lineup usage and in-game adjustments will be heavily scrutinized. The season-defining win came Friday, when the Sixers beat LeBron James and the Cavs to notch a 13th straight win and move past Cleveland into the third seed in the Eastern Conference. They led by 30 in the first half and held on late behind Ben Simmons' triple-double (27 points, 15 rebounds, 13 assists). Simmons' play that night caught the eye of James, whom the Sixers might face again soon. "He's a student of the game. He wants to be great," James said of Simmons. 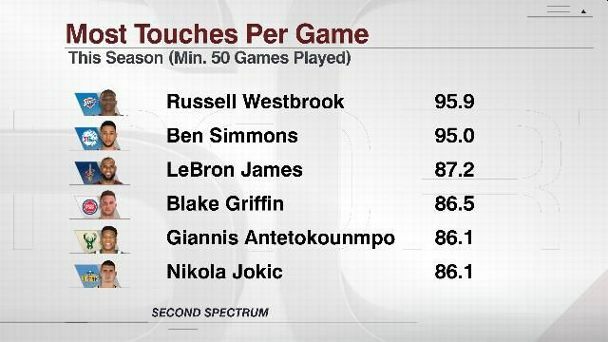 Believe it or not, a rookie leads the NBA in total touches this season with 7,589. According to Second Spectrum, Ben Simmons has more touches than MVP front-runners James Harden (5,986) and LeBron James (7,131). The organization -- and its fan base -- wants to beat Miami in the first round and see what it can do against Boston or Milwaukee in the East semis. But the fact that Philadelphia has made it to this point -- after four seasons in which lottery odds were more important than wins and losses -- is a measure of success in and of itself. Former general manager and president of basketball operations Sam Hinkie stripped the organization down in 2013 with the goal of building the foundation of a team that can contend for championships. Based on what we've seen this season, the Sixers seem to be on their way to fulfilling Hinkie's vision, no matter what happens this spring. Since Joel Embiid vs. Hassan Whiteside may be more entertaining on social media than on the basketball court, here's something to keep an eye on: a distinct style difference. Miami is effective when things slow down -- the Heat finished the regular season ranked 26th in pace, while Philadelphia frequently plays up-tempo and ranked fourth in pace this season. The team that controls the pace could control this series. Just four teams in the 71-year history of the NBA have made it to four straight Finals: the Boston Celtics from 1957-66 (going 9-1), Los Angeles Lakers from 1982-85 (2-2), Celtics from 1984-87 (2-2) and Miami Heat from 2011-14 (2-2). The Cavs (and Warriors) can add to that list this spring, and that battle alone is something worth monitoring. Add the fact that this could be LeBron's final stretch with the Cavaliers, should he opt out of his contract and leave as a free agent this summer, and the intrigue is undeniable. The Rodney Hood, Larry Nance Jr. and Jordan Clarkson trio has a grand total of 11 playoff games between them (all of them by Hood in 2017, when he averaged an underwhelming 8.9 points on 35.2 percent shooting), and now they find themselves as key cogs when it comes to Cleveland's championship chances. All three have shown flashes of brilliance after being acquired during the Cavs' trade deadline makeover, but they've also had moments in which they came off looking unreliable on the big stage. The consequences of them coming up small in the postseason doesn't just include the embarrassment of an early exit; it could also spell James' departure. Glass half full: The Cavs' 132-129 win over the Raptors on March 21, in which they allowed 79 first-half points only to storm back and win against the East's No. 1 team. Glass half empty: The Cavs' 132-130 loss to the Philadelphia 76ers on April 6, in which they trailed by as many as 30 points, only to make a game of it but fall short in the end. Both show the Jekyll & Hyde nature of this Cavs team -- undeniably talented but furiously inconsistent. A king of many things, no one is better at hitting contested shots than LeBron, who led all players this season with a 62.1 effective field goal percentage when the nearest defender was within 2 feet (among 43 players with at least 150 attempts). Cleveland should be thrilled if whatever happens in the postseason leads James to re-up this summer. Obviously, a championship would be the scenario that would most likely lead to that decision, especially with James telling Cleveland.com that "winning" and "family" will be the two most important factors when he ponders his future. As long as James has something left of his prime, which he clearly does, whatever team he plays for will continue to have a shot to win it all. Even if the Cavs don't get it done in 2018, doing enough to get James to come back will give them a chance at another chip in 2019 and beyond. Victor Oladipo was money against the Cavs during the regular season, averaging 25.0 points, 4.8 rebounds and 5.0 assists while shooting 47.2 percent from 3 and leading Indiana to a 3-1 record. It's those type of numbers that have led many to believe he'll be the runaway winner of the league's Most Improved Player award. What was he improving from? In his first taste of the postseason last spring, he averaged just 10.8 points on 34.4 percent shooting (24 percent from 3) with 5.6 rebounds and 2.0 assists as the Thunder lost in five games in the first round. Whichever Oladipo shows up will largely determine how competitive this series will be. Victor Oladipo immediately embraced being the face of the Pacers after he arrived in Indy following the trade with Oklahoma City. His scoring ability (23.1 points per game) is well documented, as he had five games of at least 30 points against teams that made the playoffs. But he's more than a scorer: Oladipo averaged a career high in rebounds, assists and steals (64 straight games with at least one steal). And no Pacers playoff series is complete without Lance Stephenson and his theatrics -- good or bad. Myles Turner. The 6-foot-11 center shot better than 50 percent for a month just once and closed the regular season by averaging 8.4 points on 33.7 percent shooting and only 4.4 rebounds in the final 10 games. The more Turner struggles, the more Pacers coach McMillan will face the question of whether he should replace Turner with Domantas Sabonis in the starting lineup. The Pacers' ending the Cavs' 13-game winning streak sent a message to the reigning East champs that winning the division wouldn't be easy. Oladipo further cemented his role as the Pacers' closer and helped them prove they would be fine without the departed Paul George. Indiana went 3-1 against Cleveland this season. Oladipo is the engine that makes the Pacers go. In transition, Indy averages 1.35 points per chance when he's on the court, which is a better mark than the Warriors. When he's off the court, the Pacers are tied for second-worst in the NBA (1.18 points per chance). It already is. Preseason predictions put the Pacers in rebuilding mode after the George trade, and GM Kevin Pritchard was supposedly swindled by Oklahoma City in the trade. Pritchard reloaded by acquiring five new rotation players, including three starters. It was less than a month ago that LeBron and the Cavaliers were the team chasing the Pacers for first place in the Central Division. Nobody would have thought that would have been the case at the start of the season. Lance vs. LeBron: Part 5. These two have quite the history, going back to when Stephenson held up a choke sign from the bench after James missed a free throw during a playoff series between the Pacers and Heat in 2012 (LeBron has won all four head-to-head playoff series matchups). There were Stephenson's flops and desire to blow in James' ear during the Eastern Conference finals in 2014 two years later. Things continued this season, with Stephenson attempting to distract James by drawing him into his sideshow antics. The Heat, by their nature, play incredible games. They've had 19 one-possession games. They've played nine overtime games. They scrap and claw, and Erik Spoelstra conjures stuff up. They're always worth watching. Even with his max contract, Hassan Whiteside is constantly trying to prove himself -- that's his lot in the NBA. Two years ago, he got injured in his first playoff run with the Heat, and therefore the results were incomplete. Now he gets another chance. There are a couple choices, but the best is probably Dwyane Wade hitting the game winner to beat the 76ers, the Heat's first-round opponent. He scored 15 of the last 17 points. It was another one-possession game, and he was a finisher for a team that is constantly looking for finishers. Miami gets the most out of its pieces. Exhibit A: Kelly Olynyk. Although he's averaging only 11.5 points per game this season, he has been one of the most versatile and efficient scorers in the NBA. Olynyk ranks second in points per direct drive (minimum 100 drives) and first in points per direct post-up (minimum 100 post-ups) this season. The Heat are underdogs. They have some confidence against the 76ers after winning their past two matchups. It would be helpful if some of their young players have positive experiences, win or lose, to set them up for down the line. Whiteside vs. Embiid, if/when he plays. If Whiteside wants to make a statement, he may get his chance in Round 1. It's tough to predict given Embiid's injury issues, but this big-man battle would greatly impact this series in the paint, and likely Twitter after the game. 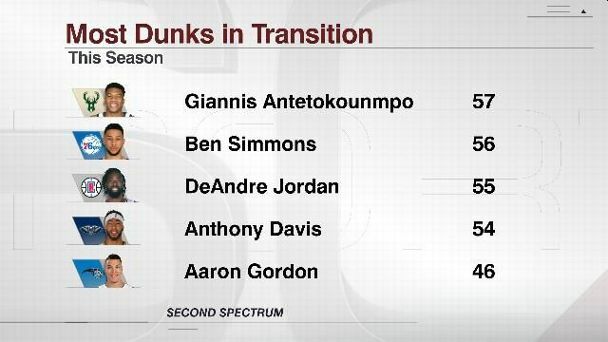 One word: Giannis. The Greek Freak is one of the most exciting players in basketball and watching him perform on a playoff stage will be fun. On top of that, Jabari Parker is out to prove he can still be a dominant player in the biggest games of the year. He will be a restricted free agent this summer, and the Bucks have to decide whether they want to lock him up as part of their future. How he performs in the postseason will likely have some impact on negotiations later this summer. Aside from Antetokounmpo and Parker, Eric Bledsoe has a chance to show he can play with more consistency in the most pressurized games. The Bucks invested this summer's first-round pick to acquire Bledsoe from Phoenix. Now he needs to prove he was worth the investment. The Bucks flat-out gave this game away by making several terrible decisions in the waning seconds and snatching defeat from the jaws of victory in a 128-125 overtime loss to the Nuggets. The Young Bucks like to run, none more so than Antetokounmpo, who has recorded 57 dunks in transition this season, most in the NBA. Among those dunks, 31 have been made while contested, also most in the NBA this season. Unless they can shock the depleted Celtics in the first round, the Bucks' season will not be considered a success. They fired Jason Kidd earlier in the season and didn't take the next step in their evolution. With cap issues this summer and an important decision to make on Parker's future, the Bucks have a lot more questions than answers. As the Celtics continue to deal with a slew of injuries, most recently to star point guard Kyrie Irving, many pundits wonder if Giannis Antetokounmpo can carry the Bucks into the second round. The key will be just how many people Celtics coach Brad Stevens will end up running at Antetokounmpo. Will Al Horford, who figures to get plenty of time squared up against the Greek Freak, still have enough gas left to help carry the depleted Celtics offensively? If Horford can at least slow down Antetokounmpo, it will fall on Khris Middleton and Eric Bledsoe to pick up the slack. Despite a frustrating up-and-down regular season, the late March return of John Wall makes the Wizards a dangerous team in a rather wide-open East. Washington is exactly the sort of low-seed opponent that no top squad wants to draw. The Wizards have a lot of talent but also a core with plenty of playoff experience. The question is whether Washington can pull itself from the general malaise it operated under for much of the regular season. Most of the attention will be on Wall, but only one player on Washington's roster had a better net rating during the regular season: Otto Porter Jr. In fact, the Wizards go from owning a team-best net rating of plus-5.3 with Porter on the court to a team-worst minus-6.3 when he's on the bench. Washington's offense is 6.5 points better per 100 possessions with Porter on the floor. These are the situations in which the Wizards need Porter to live up to his lofty contract. Despite sitting out two months with a knee injury, Wall looked sharp in his first game back, putting up 15 points and 14 assists. After the game, Wizards coach Scott Brooks said of Wall, "That Ferrari is pretty good." That same night, Porter Jr. finished with 26 points and 11 rebounds, while Beal had 22 points with six 3-pointers. It was a reminder of Washington's potential when all of its weapons are available. Don't let the Wizards put a spell on you. Only Golden State has generated more shots off cuts to the basket than Washington this season. This will be Washington's fourth playoff appearance in five seasons, and even though the Wizards have advanced out of the first round in each trip, that'll be a daunting task this time. A first-round exit would leave a very bitter taste and force the team to ponder its direction, an uncomfortable position given that its core is locked up long-term. Success is a first-round upset and being competitive in Round 2, though that would ultimately be a replay of recent postseason runs. Washington's depth. The Wizards' starting five are playoff tested and, if healthy and playing with the sort of consistency they lacked at times during the regular season, will make Wahsington a tough draw for the top-seeded Raptors. The big question is what happens when the Wizards go to their bench. The Raptors won an East-best 59 games this season in part because of a deep second unit that coach Dwane Casey has pledged to continue leaning on in the postseason. Can players such as Tomas Satoransky and Kelly Oubre keep the team afloat when the stars sit?